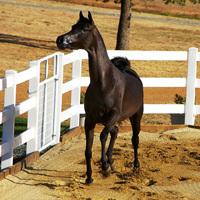 A beautiful new addition to the select stables of our good friend Mr. Mohamed Jaidah, Doha, Qatar. 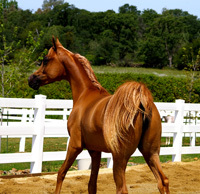 Enjoy many years of wonderful production.. from this remarkable young broodmare! We are very pleased to announce the placement of this promising young colt.. as he departs for the beautiful shores of the Arabian peninsula! 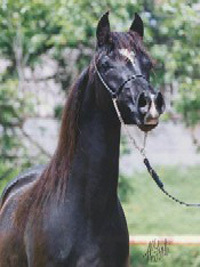 A very special addition to the emerging show/breeding program of our new friend.. Mr. Mohamed Jaidah, Doha, Qatar. Our warmest congratulations to HH Sheikha Fatima Hazza Zayed Al Nahyan, on your acquisition of this very special show/breeding colt! 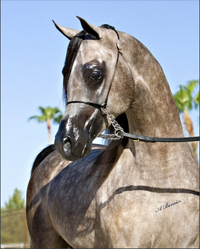 His departure to Abu Dhabi, UAE will bring many exciting adventures as your riding companion and new young herd sire. 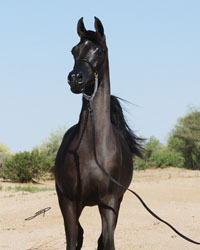 A very special reunion, as one of the Arabian horse worlds' most highly regarded Homozygous Black show and breeding mares, rejoins her spectacular Dam.. at their new home in the United Kingdom. We extend Ms. Louise Millington our sincere wishes.. for many years of amazing show success, fantastic production and un-conditional friendship! A special congratulations to Ms. Louise Millington, on your very exciting purchase of one of the pre-imminent Homozygous Black producers in the world today! We wish you the greatest success on Dancer's future foal production...as she departs for her loving new home in the United Kingdom. Congratulations to Mr. Filippo La Porta, on your acquisition of this stunning colt! We look forward to an exciting future, both in the show ring and the breeding barn, as this gorgeous young colt departs for his new home in Italy. 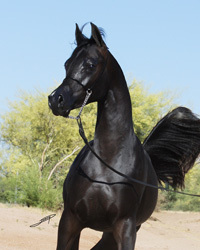 Congratulations to Nathalie and Carl Schroeder-Goedert, of Belgium, on your acquisition of the very fancy Mystic Dancer ISA. 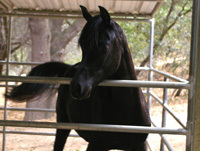 We wish you much success with this beautiful black filly. A special thanks to Brookville Arabians.